An animal disease research organization I know started a Google Ads campaign with the hope of increasing donations to support a groundbreaking research project. Unfortunately, no matter how they asked people to donate in their ads, nobody did. It wasn’t until a volunteer suggested a new approach. Instead of asking for donations in their ads, she suggested offering a free, helpful resource, and in the resource ask for donations. While doubtful it would work, they thought they’d give it a try. They created a simple guide to help concerned dog and cat owners assess various lumps on their pets. Then advertised it for free with their Google Ads Grant. The guide was an instant hit. Thousands of people googling how to diagnose their pet's ailments clicked the ad. Those that downloaded the guide identified with the organization’s mission — and donations shot up. Within 18 months, they nearly doubled their investment in the campaign, allowing them to continue funding their research to bring animals a longer, healthier life. 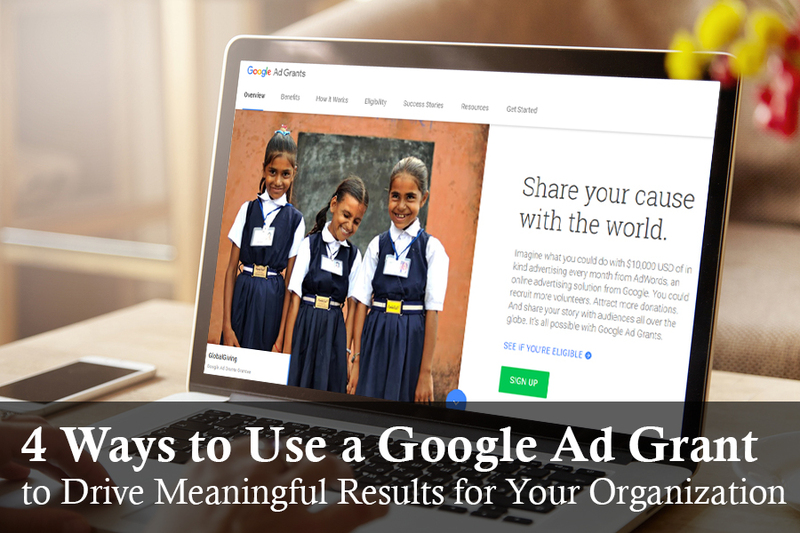 If you’re looking to make your Google Ads more effective, just like this organization, take a look at this list of the four most effective ways I’ve seen nonprofits use Google Ads to reach their goals. 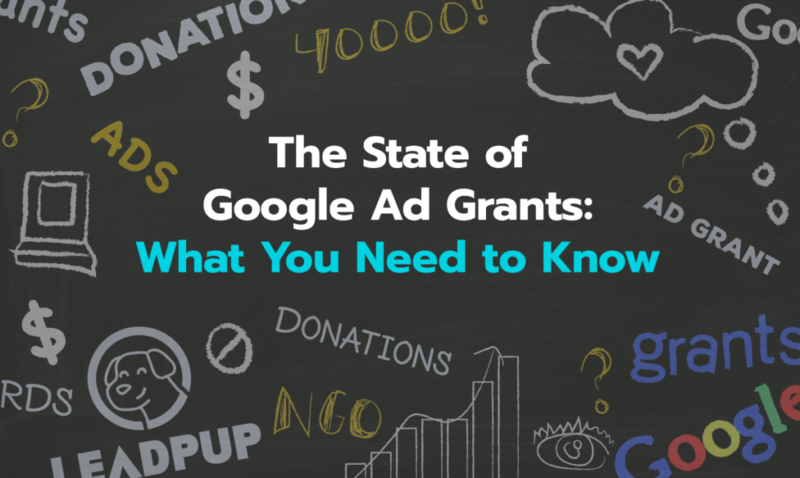 But before I dive in, I’d like to cover some basics on the Google Ads Grant — a program providing qualifying nonprofits with $120,000 per year in Google AdWords. The Google Ad Grant program is a gift from Google to all qualifying nonprofits to spend $10,000 per month on the Google AdWords platform (and $40,000 per month if your nonprofit earned a GrantsPro while it was available). Google Adwords is a tool that lets advertisers pay to have their ads shown in Google Search results based on what people are “Googling.” This allows advertisers to pay for their ads to be shown when someone Googles terms relevant to their business, or in our example, animal disease research. As an advertiser (and nonprofit), you are targeting your ads based on the keywords that your audience is searching, as opposed to age, gender, and other more common targeting characteristics. Based on how often a term is searched, and how often that results in a click, Google charges a price to advertise using different keywords. With over 3.5 billion keyword searches on google per day, the AdWords audience is enormous. Google Ad Grants give nonprofits access to these 3.5 billion knowledge-seeking queries alongside commercial advertisers with a free AdWords budget. However, as a for-profit platform, Google is not giving away their most valuable ad space. Ads placed with a Google Grant have some limitations. Most notably, Ad Grants ads have a limit of a $2 Cost-per-Click (CPC) bid. For example, had the animal research organization tried to offer content around healthy pet food, they would have been drowned out by all of the pet food companies advertising there (see picture). Chances are, these competing advertisers have paid bid well over $2 per click, ensuring that Google will show their ads for relevant searches. As a nonprofit, the trick is figuring out how to place ads that will get shown for $2 and still have high value for your organization. And don’t worry, Google provides a suggested bid, so you will know when the competing bids are beyond your grant’s $2 maximum. All together, the AdWords platform offers endless keywords to target, and opportunities to use your Google Ad Grant to get real results. In fact, many nonprofits are unsure where to start. Does your nonprofit use a few key events to underwrite a large portion of your budget? Or perhaps this event is your organization’s main way of demonstrating your local presence and impact? Perhaps our animal disease research org. were to organize a local pet training workshop? While digital giving is on the rise, up 14% in 2016 (M&R Benchmarks 2017), the majority of all donations happen offline, and events make up a big part of this. If your organization has a major event coming up, use your Ad Grant to promote the event. Make sure you target keywords relevant to your location too (ie “Boston pet training”). This will get your ads in front of local Googlers who can actually attend in person (as opposed to all things “pet training”). Adding in this digital promotion, at no cost to you, can help make this your most successful pet training workshop/gala/fun run/[your event here] yet! Next Steps: Start planning your AdWords campaign for your event a couple of months before the event date. This will give you time to continually improve your keyword targeting as the event approaches, resulting in more attendees! Content marketing is quickly becoming a top strategy for organizations to grow their donor/member audiences. Many organizations sit on a wealth of knowledge in their respective fields, and offering this expertise to the public is a great way to establish your organization as a thought leader. The trick is identifying what information your audience values (Expert Google Grant Tip: test different content ideas with your grant). With LeadPup’s help, our example organization was able to look at search trends to discover that a lot of pet owners were searching Google for what to do about their pet’s questionable lumps, and (for example) not so many were searching for how to make homemade dog treats. This set the course for the content we would continue to develop. Once your content direction is set, promote it with your Google Grant. By using the keywords relevant to your content (eg “how to check my dog for cancer”), rather than strictly your cause (all things “animal disease”), you expand the size of your potential audience. In this case, we were able to make our organization relevant to all pet owners (nearly half of all US households), rather than just those who have chosen animal disease prevention as their cause of choice. Next Steps: Identify your organization’s valuable content, and start promoting it with your grant. As more people see your content, your organization’s brand grows. Bonus points if you can convert these new visitors into donor leads by capturing an email address on your content page. Petitions have become a major source for new supporters for many organizations. In fact, for many larger organizations, they provide the main source of new audience growth. Petitions work by allowing organizations create an online signature page for citizens to pledge their support for a cause, such as increasing government funding for animal cancer research. With a successful petition, not only do organizations get a wave of support, a powerful tool to drive policy change (in the form of thousands of signatures), but also an extensive list of email addresses for your organization to cultivate to become donors or members. With your Ad Grant, you can supercharge your petition by advertising it with your free AdWords budget. Next Steps: Google will only allow your nonprofit to drive traffic to its own domain (eg: stopanimaldisease.org/...), rather than the petition platform’s site (eg: care2.org/increasegovtfunding), where your petition likely lives. To get around this, try building a landing page or blog post with a clear call to action to get visitors to your eventual petition. This added step will cause some churn, which is why we prefer the direct value provided through content promotion. Before spending real dollars on Facebook, paid Adwords, or any other paid platform, test your creative with your Google Grant. This allows you to save your precious advertising budget to promote only creative that you know converts. Google AdWords text ads (the type your Ad Grant buys) offer headline and a couple of lines of body copy, so you won’t be able to test images. That said, this is a free way to cut out the guesswork on a large part of your creative. Going back to our animal disease research example, if we want to start a paid Facebook campaign to get new donor leads, we could see which headlines (“How To Check Your Pet for Cancer” vs. “Pet Cancer Prevention” ) and body copy (“download the free guide to learn more” vs. “should you be worried about that lump or not?”) got the most clicks and converted the most donor leads. By the time you actually pay for your advertising campaigns, you will have the statistics from your Ad Grant campaigns to back up your headline and copy choices. Next Steps: Identify what media you plan to use for paid campaigns, particularly to drive awareness and lead acquisition. Then, test your headlines and body copy, one at a time, using your free AdWords. Jamie Finney leads branding and product development at LeadPup, a solution for organizations looking to grow their donor and member audiences. He has worked for multiple nonprofits and fundraised both on and offline. His passion is helping organizations find and use the most effective tools to create change.